You are here: Home / News / Former Vice President Joe Biden Needs A Hug. Former Vice President Joe Biden Needs A Hug. (ThyBlackMan.com) It’s pretty obvious to everyone who isn’t Joe Biden that Joe Biden’s quest for the White House is a dead campaign fondling. As a practical, tactical matter, that’s good for us conservatives. For all his goofiness, gaffeiness, and gropiness, Crazy Uncle Joe had a way of hiding his unabashed and unrestrained liberalism behind this easy-going, sure-let’s-crack-open-a-couple-of- Budweisers façade. For reasons that many of us find utterly inexplicable, he seems to connect with normal Americans in a way most of his smug and smarmy comrades don’t. It’s not that he’s not smug and smarmy – if you remember the Clarence Thomas lynching you aren’t fooled by his dopey regular guy act. It’s that he is probably the only one of the Democrats who can fake it well enough to threaten Donald Trump’s midwestern electoral power base. But now he’s gone, having eskimo-kissed away yet another shot at the Oval Office. This guy has been running for president for a third of a century – he bowed out of his first try after it turned out he was cribbing his bio from some Brit pinko. Obama finally picked him for a running mate not because of what Joe brought to the table but what he didn’t – any chance that he would overshadow The One. Think of the presidential runner-up on the hilarious TV show Veep, only Joe is a lot dumber and handsier. Word on the street is that it’s the Bernie Bros behind the knife in the kidney that is the daily drip-drip-drip of women recounting Biden’s various creeperies. That’s strange – you would think Sanders would just naturally appreciate someone named “Joe.” But it’s a good lesson for those of us who might be suckered by the Vermont Marxist’s funny old guy act. Bernie Sanders is a communist, and communists put their enemies in the ground. He is not a nice old man with wacky hair. He’s the eager acolyte of the butchers who murdered north of 100 million people in the last century. Compared to most of the victims of Bernie’s poisonous ideology, Joe Biden has gotten off easy. And in keeping with Cultural Revolution best practices, Biden took to YouTube to abase himself in what is certain to be a vain effort to ensure his campaign doesn’t die before it is born. Watching a grown man set fire to his dignity by sucking up to these aspiring fascists is mortifying – it turns a delightful bit of schadenfreude into something sad. Biden’s cringey behavior is something we conservatives have laughed about for years and the media only suddenly discovered when Joe stopped being useful and got in the way. Biden’s pawing is sort of the counterpoint of John McCain’s conservative bashing. The mainstream media saw no evil when Touchy Toucherman was feeling up every skirt within his bursting radius, just like it loved Johnny Maverick when he was giving what-for to those wicked Rethuglicans. But the MSM turned on a dime and bared its collective fangs when these two dared get in the way of progress, be it McCain taking on (sort of) Obama or Joe lib-blocking Bernie, Beto, Brown’s ex, or Mayor Buttawhatever. It’s important to remember that any Democrat pushing the #MeToo agenda is full of Schiff. The party of Chappaquiddick Teddy and Bill “Put Some Ice On That” Clinton views the protection of women not as a moral imperative but as an intermittently useful pose. And it’s a pose they don’t bother to strike unless there is something in it for them. That’s why ancient tales about Brett Kavanaugh dominated the headlines and why you now have to think real hard to remember the name of that Virginia Lieutenant Governor, who remains in office alongside the guy who still can’t tell us for sure if he was the dude in blackface or the dude in the Klan get-up. 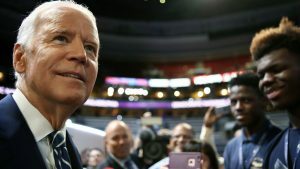 It’s baloney, and everyone knows it, including Biden, who has got to be wondering how his decades-long free pass (a guy familiar with Delaware politics told me “There’s not a female fanny in the state that doesn’t have Joe’s paw-print on it.”) morphed into a campaign death warrant overnight. But that’s the nature of social justice warriorism – it’s a weapon designed to take out enemies by making it impossible to stay in accord with the rules because the rules keep changing and you don’t find out until you get dragged into the liberal kangaroo court and condemned. Welcome to the world you helped create with Anita Hill, Joe. It couldn’t happen to a fake-nicer guy. And what is the world the Democrats promise us? Venezuela North, as I chronicle in my action-packed novels about an America split apart into red and blue, People’s Republic, Indian Country and Wildfire. Check them out – there’s definitely no hugging.